Our programs are designed to create a stimulating, flexible environment where children can explore their surroundings whilst they develop physically, emotionally and intellectually. Our play-based Educational Plans are designed to create a stimulating, flexible environment where children can explore their surroundings whilst they develop physically, emotionally and intellectually. We provide a balance of indoor and outdoor activities that offer variety throughout the day. During indoor play, children have many experiences in learning areas with a variety of resources including iPads in the 3-5 room. Project-based learning is a way for children to be involved in their own learning. We use different types of formats to gather and display children’s voices and their ideas about a topic including what they know and what they would like to learn. We then use this information to plan activities and learning spaces to provide the children with a range of learning experiences. Our projects are displayed on our walls, our online portal is updated regularly and each child has a portfolios containing all your child’s individual records. Educational Plans (each with a goal) are displayed in each room and use the Early Years Learning Framework as a foundation for children’s learning. These plans are reguarly reflected on and evaluated to ensure children are progressing towards the planned goals and help to decide what will continue. Our plans incorporate children’s interests, intentional teaching, family events and cultural experiences. Throughout the year we cover many important learning areas such as dental health, road safety, child protection etc. Special days and theme days are celebrated in the centre and each year we choose a charity organisation to which we raise money and donate goods. 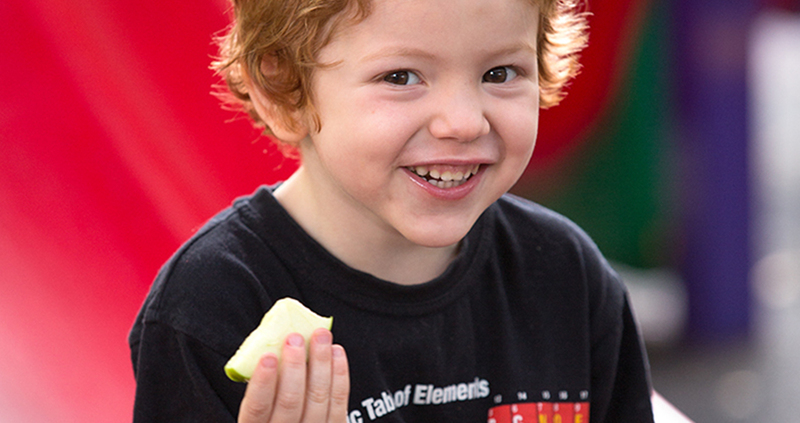 Appleseed encourages and supports parent participation and involvement in the centre. You are welcome to drop-in to the centre at any time, although we do ask that you phone first. You are also more than welcome to participate in special events, excursions, art and craft activities, story reading and so on. If you have suggestions or feedback about any of our programs, we genuinely want to hear it. Please call Hannah on 9869 0555 for a chat, or arrange a time to drop in and see her. The Education Department’s Early Years Learning Framework is a vision for all children to experience play-based learning that is engaging and builds success for life. Our Early Childhood Educators use the EYLF as a guide for children’s learning and use the outcomes in each of the five key learning areas to further develop each child. Centre Educators will use the Framework in partnership with families, to develop learning programs which are responsive to children’s ideas, interests, strengths and abilities. Throughout the year we will collect a variety of work samples, observations, family input, group projects and developmental reports. These are displayed in a variety of ways, online, on our walls and in your child’s individual portfolio. Each parent has full access to their online portal to access learning activities and projects. Reports are done for each child twice a year and provide an in-depth view of the child’s development which reflects the key learning outcomes in the Early Years Learning Framework. Munch & Move is a fun, play-based program that promotes physical activity, healthy eating and reduced screen time (e.g. watching TV or DVDs, playing on computers and small hand-held games devices). The program is a NSW Government initiative with NSW Health as the lead agency. Kindy Active uses fun games and challenges to develop balance, spatial awareness, coordination, and self-confidence in toddlers and pre-schoolers. Our special Kindy Active teacher, Ms Carol, visits the centre each Wednesday morning. We provide the 0-2-year-olds with a free lesson each week, but there is a small charge for participating 2-5-year-olds. Ready Steady Go Kids is a multi-sport & exercise program for children aged 2.5-6yo. The program has been designed by a physiotherapist and is taught by fully qualified instructors. It is a great way for kids to learn the concept of sportsmanship, boost school readiness skills, development of gross and fine motor skills, encourage a healthy lifestyle, while learning a basic understanding of a variety of sports. We are currently offering classes at Appleseed Childcare every Friday (there is a small charge if you would like your child to participate). 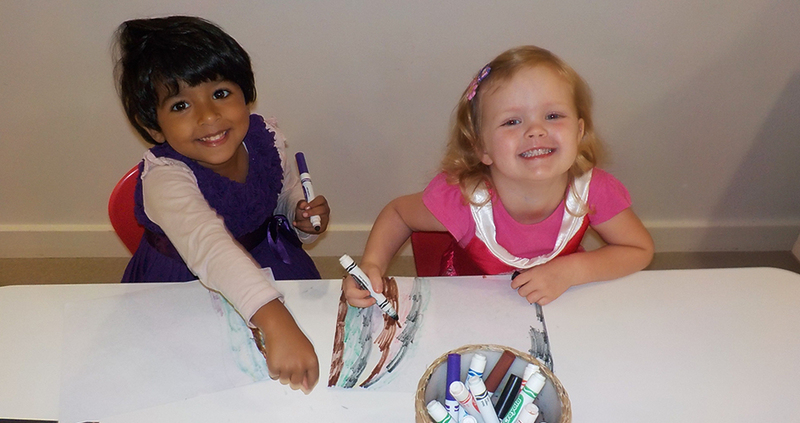 At Appleseed we run The Cultured Kid’s Early Childhood Program across our entire centre. "The Cultured Classroom" is an immersive, play-based curriculum that includes short interactive videos, music and loads of physical games that we know all children will love. We know that the best time to learn a language is before a child goes to school, which is why we are committed to doing everything we can to give your child a head start through this program. All the children that attend Appleseed are provided with complete access to The Cultured Classroom at no extra cost. Our aim is to prepare each child to their fullest potential in preparation for formal schooling. Our holistic Red Room Preschool program is led by University qualified Early Childhood Teachers and fosters children’s development and school readiness through play experiences, spontaneous play and guided learning experiences. We implement the PreLit Program as part of our Preschool program. This program was developed by Macquarie University for children who will be making the transition to formal schooling the following year. PreLit is a skills-based, early literacy preparation program for preschool children in the year before school. There are 108 short lessons that incorporate different types of phonological awareness activities and oral blending and segmentation activities as well as print awareness. This program has been designed to complement a play-based learning environment and provides Early Childhood Educators with the tools necessary to teach pre-literacy skills and concepts in a fun and engaging way. PreLit forms part of our high-quality School Readiness program that we offer in the Red Room. We also implement a social skills program allowing children to gain and develop important tools to assist in their transition to formal schooling. Help children develop socially skilled behaviours that will help them develop friendships and get along with others.